Love is the appropriate theme of this week’s 52 Snapshots of Life photo challenge. This challenge is hosted by TLPB and open to anyone on social media. It’s a coincidence that I have more Valentine’s mock-ups or art pieces that any other holiday except maybe Christmas. This is odd cos I’m a confirmed bachelorette. I have many mancats and love them all. 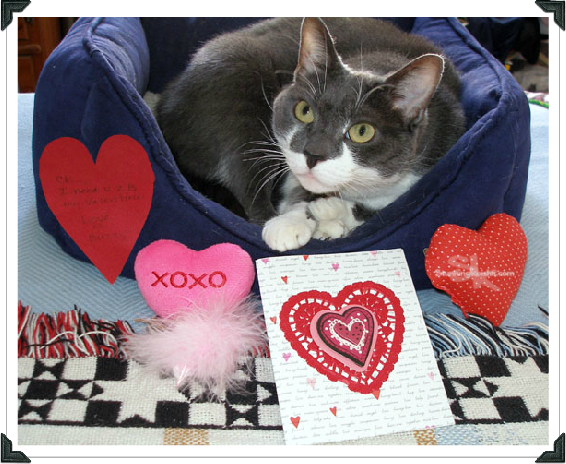 Over the years, I’ve received Valentines from my favorite mancats: Buzz Lucas, Parker S. Kat and Spitty. They’re all special to me. They’re all cherished, which is the theme of the other PhotoHunt. Can you read the message Buzz wrote on the first heart? Above all, I have a special relationship with my Pop. He’ll always be my favorite guy. Shortly after I moved in, he had major, major, major back surgery (his surgeon’s exact words). We bonded once he got released from hospital. Even though I wouldn’t let him touch me, he talked softly to me during the six weeks he was recuperating. I learned to love him and his voice. He’s the only one who can pick me up. 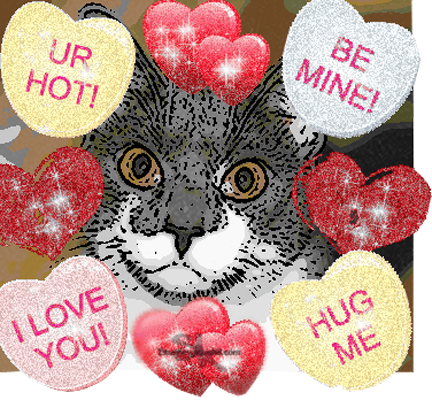 For the Caturday Art Blog Hop, I’m using the very first Valentine’s art image I ever made back on 2/11/10. It’s probably the first art image I ever made. Unfortunately, the online photo editor I used is no longer in existence. Blingeasy was great because it had an entire tab for just those sugar message hearts that they sell in stores. This is still my favorite among all the images we’ve created. Another of my favorite images for the Anipal Olympics was also created in Blingeasy. Back then, I didn’t have PhotoShop and I didn’t know the difference between a jpg and a png file, which is why TW had to delete all the white around the hearts. I didn’t quite know what a gif was but Blingeasy did it for me. I was so young and innocent. HAH! I don’t often use pics that are in focus and keepers for my art but I made this new art image by using the Desire sketch action in PhotoShop. Then I went to PicMonkey to add a pink tint to the background and a pink scalloped frame. This pic was taken the night before the image above. TW had to do two separate photo shoots cos the evening one was a little dark. Happy Sweeties Day to everybuddy. I’m sending a big, sloppy kiss to all the male cats and a little kiss on the cheek to the ladies. I’ll be waiting at the mailbox to collect this year’s cards and gifts. Happy Valentine's Day, CK! Love all the pink on that last one, and the special relationship you have with your Pop. Happy Valentine's Day, CK! I'm spending the day at the cat show, trying to make judges kiss me! Aw that photo of you and your pop is one of my favorites! You are so sweet together! The art images are pawsome! I still haven't used png file or gif. I love the pink frame and tint in the last image. Very pretty :-) Have a happy Valentine's Day! THat was such a terrific post CK! Happy Valentines Day from all of us! Happy Valentine's Day, CK! Love the photo with you and your Pop! You and your Pop always make us smile. There's just something about a CatDaddy and his girl. Wishing you and your peeps a very happy Valentine's Day, CK. Those are great images! And an awesome picture with your Pop. Aww... what a sweet story about you and your pop! Happy Valentine's Day to you all. That's a very sweet picture of you and your Pop. You always lookstunning, and we are sending sweet kitty kisses to your Pop ( we don't have one, so we think he is special). Oh, and lovely ladycat headbumpies to all! Happy Valentines Day! That's great artwork! We're all spending extra special time with Dad while he's recuperating too. We know your mancats who gave you Valentinys - we love our Twitter bud, Buzz Lucas! And Allie says there's NOTHING like a Cat Daddy. CK you always make the best graphics! Happy Valentine's Day CK. That is a lovely pic with your Pop. Happy Valentine's Day , CK ! Wishing you a super special Valentine's Day, CK. We hope it was filled with love, laughter and happiness. That picture of you and Pop is beautiful! CK - Yous a grrl cat after mine own heart! Happy Valentines Day to yous and may yous be filled with lives! Pawsome photos as always C.K.!!! Hope you had a wonderful Valentine's day!!! 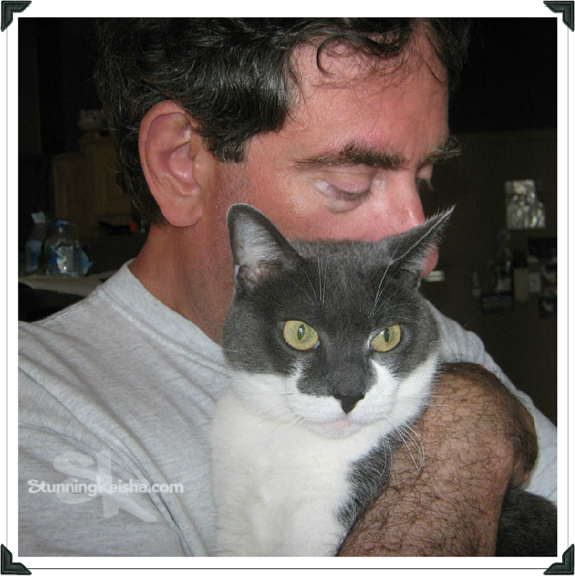 Love that photo of you and your Pop, purrfect for love! Happy Valentine's Day, dear CK, cool art this week! Happy Valentine's Day CK. I'm a daddy's girl too and it's wonderful. I love your first valentines image. It's simple, but very creative. A belated Happy Heart Day - our beans celebrated by going out of town yesterday! TW sure moves around in alot in all the different photo doobreys! Nice work! A belated Happy Valentine's to you CK. I like to spread the lurve too, but the human scuppered my day yesterday by having more humans come to the house so I had my work cut out sucking up!!! You are a popular lady, but it is very nice that your Dad is #1 in your heart. I love the photos and the artwork...very nice job! You are so fortunate, I didn't get one single card or gift...guess I better 'send' some next year, na'mean? Wooowooooo! 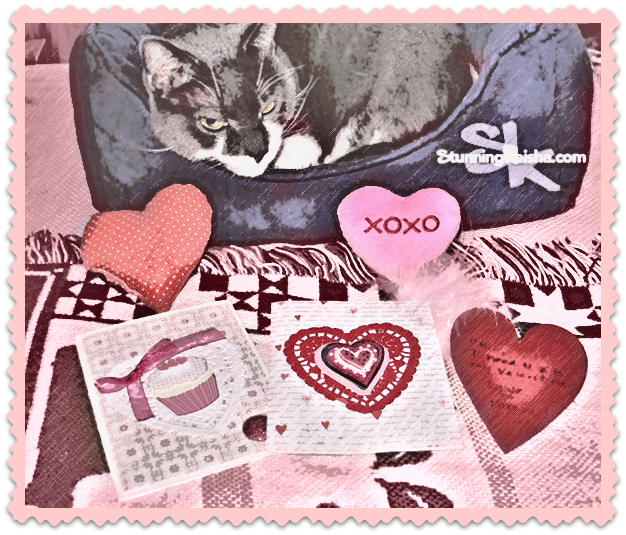 Hoep you had a fab V Day my kitty furrriend! I'm so impressed by your photo editing. Love the photo with your daddy too. His patience was rewarded! You are a very pretty kitty! My cat bro Bert says he might like to get to know you. I would avoid him, though, as he is trouble!